I’m not a green beer drinker, a Jamison shot taker, or a fan of cabbage. But I love St Patty’s day, celebrating the Irish, and having a national green day. What a pick me up for your week or maybe a hangover remedy from your Irish celebration? 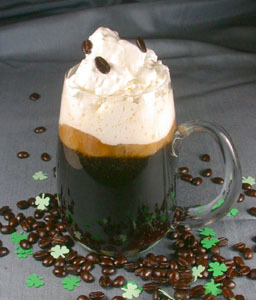 In honor of the Irish ~ try Irish coffee! The heavy cream can be whipped into whip cream, then put in fridge to chill. Brew the coffee and combine with the whiskey and sugar. Mix well and allow sugar to dissolve. Top off the coffee mixture with some whipped cream. Use the back of a warm spoon to help drop the whipped cream perfectly on the surface of the coffee, without breaking into the mixture (this may take some time to master). Enjoy your nice drink to help wake you up! You can also add Mint Liquor, instead or in addition to the Whiskey. This will also transform it into a festive green drink. If the Whiskey taste rubs you the wrong way, or perhaps is too potent for a morning pick up, try Bailey’s and Coffee. One of my favorites! Sometimes my weekend treat is walking along the beach with a cup of coffee in hand and topped off with some Baileys. Search around, mix it up, and find your perfect Irish cocktail. Stir and mix and enjoy! 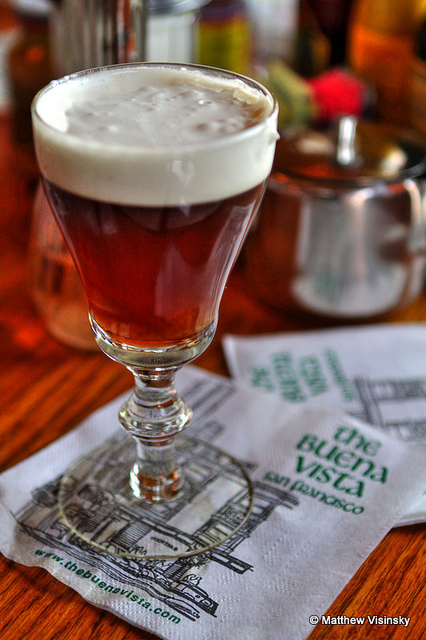 I had my first real experience with irish coffee in San Francisco at The Buena Vista. If you are ever in the area you must go see this hidden and historical gem. 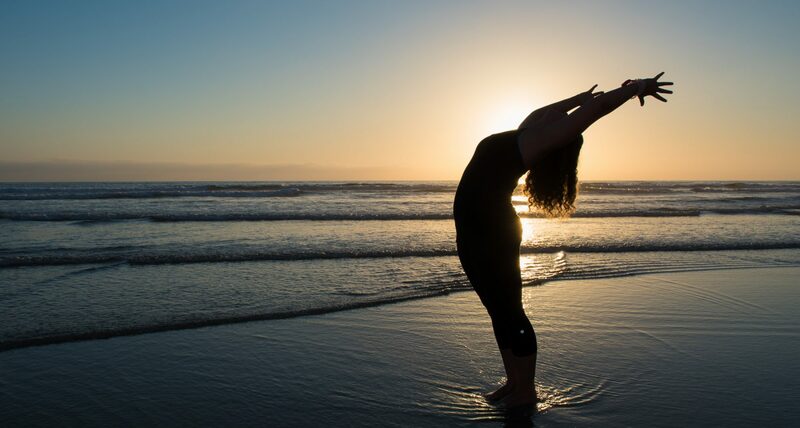 Located near fisherman’s Warf, next to the Powell-Hyde Cable Cars, it’s a great place to stop in or meet up with a friend. It has been in the same spot since 1975 and is still always bustling with customers and tourist. Known for their Irish Coffee recipe created in 1952 by the owner of the Buena Vista and a travel writer who dared to mock recipe from the Shannon airport in Ireland , the pub has mastered the concoction after spending nights mixing and even flying over to Irish land. “Success was theirs! With the recipe now mastered, a sparkling clear, six-ounce, heat-treated goblet was chosen as a suitable chalice.” Read more about famed Irish Coffee drink and how to recreate. I have not been to Ireland yet, so I cannot attest to having a real Irish Coffee in Ireland, but this is delightful and surprisingly tasty. I recommend it to any SF tourist, native, or local. Spend your afternoon at The Buena Vista!